The ongoing El Niño is rapidly weakening and may be replaced by a La Niña in the second half of the year. However, it's been the strongest El Niño on the record – slightly beating the 1997-1998 El Niño that used to be known as the "El Niño of the century". This fact has some correlation with the temperatures that were elevated. Although it's always about hundredths of a Celsius degree, January, February, and March were the warmest months with those names on the RSS AMSU satellite record. However, April 2016 was already cooler than April 1998 again. What about the Arctic ice? Left-wing "science" media such as The Guardian and The Pig were impressing us with the claim that the Arctic ice has been at record lows for several months. However, this isn't the case at all. Take The Pig's favorite Arctic graph page. 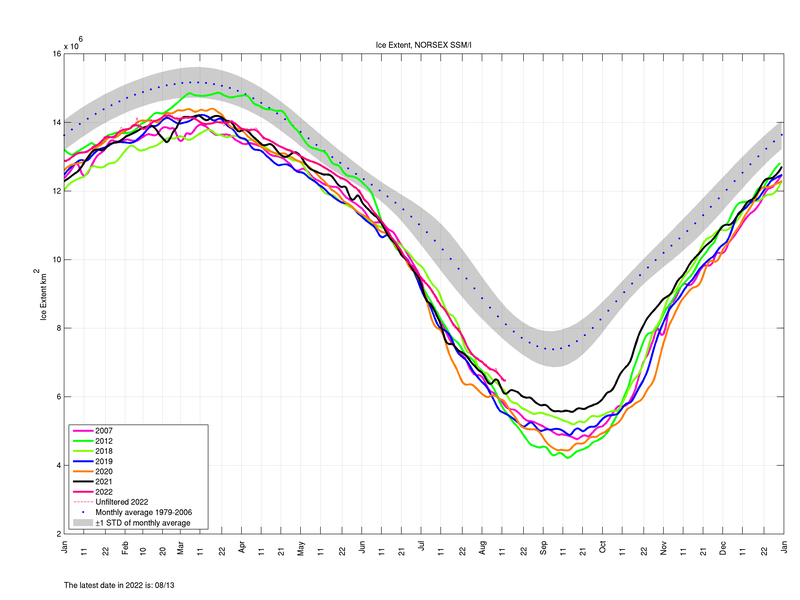 You will see several graphs where 2016 looks like the "lowest sea ice" year. However, it's only the lowest one in comparison with several recent years. If you look at any of the graphs that goes back at least to 2007, you will see that 2007 – the year when Al Gore's global warming influence could be peaking – saw a significantly lower Arctic sea ice area than 2016 so far. The difference is not "significant" to the extent that a sane person would care about it – the differences are tiny in any "absolute" sense. But these 2007-2016 differences are larger than the differences between 2016 and many recent years. On the page, you may e.g. look at the second picture (and first mostly-white graph) in the right column, something that says "Ice Extent, NORSEX SSM/I" and click at this graph. You will get to this page with at least 2x2=4 graphs. The upper two only go back to 2008 but the lower ones show 2007 instead of 2008. Click e.g. at this one. You will see very clearly that the light violet 2007 ice extent was lower than the red 2016 ice extent on a vast majority of the days in 2016 so far. Just to be sure, the violent wiggles in all the ice date since early April 2016 are due to a defective gadget. Up to the early April, you may simply see very clearly that 2007 saw less ice than 2016. There is at least one other graph on the Pig's page where you can go back at least a decade and see that 2007 had less ice than 2016. 2007 was really about "3 standard deviations" below the the average; 2016 is only about "2 standard deviations" below the average. It's a different league. You may also find a not really famous Japanese JAXA where a different definition of the sea ice area is used and 2015, 2016 are record holders – but the difference from years such as 2007 is much smaller than in the datasets where 2007 had the record low sea ice area. You may remember that there were pretty cool years such as 2008 and 2009 when many climate skeptics loved to talk about the weather. ;-) So they were logically following after some warmer years. 2005 was warm and 2006, 2007 were cooler but the ice tends (and ice losses tend) to accumulate which is why the minima in 2007 were natural. So the claims about the new records of Arctic sea ice in early 2016 are simply falsehoods. Incidentally, the Antarctic sea ice is near the normal levels – the values are a very good approximation of the average – so the alarmists don't talk about the Antarctica at all. You could have predicted it – they don't have the integrity to talk about any data fairly. But in the case of the Arctic ice, they were simply lying to our face. The Pig has also talked about the insufferable heat in the Arctic and the polar bears that are melting away. The Inuit tribes live there, know what's going on, and they say that the polar bears are doing very well – which is why the Inuit feel really good when they hunt for them. But can you appreciate the incredible absurdity of this guy's talking about the insufferable heat in the Arctic? This guy lives in New Mexico, basically a desert. Look at the climate data for Las Cruces, New Mexico, where he lives (the second largest town in NM). The record highs for the 12 months of the year are 26, 30, 32, 36, 40 (May), 43, 43, 41, 39, 35, 31, and 26 degrees Celsius. He not only lives in that hot hell but happily floods the Internet with garbage. And he has the guts to say that the Arctic has become insufferably hot. What doesn't this piece of pork evaporate if he lives in conditions that are some 30 °C warmer than the "insufferable heat"? The idiocy of this global warming propaganda is just absolutely incredible.